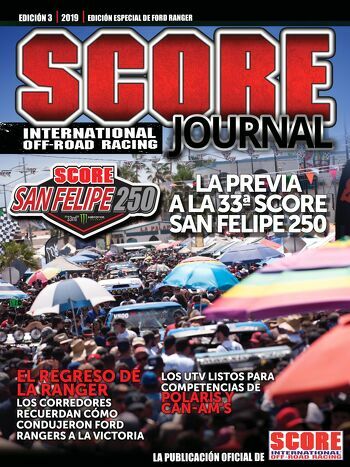 ENSENADA, Baja California, Mexico – With late entries accepted during on-site racer registration this week, a total of 223 teams are officially entered as of tonight for this week’s 48th annual SCORE Baja 500. Round 2 of the four-race 2016 SCORE World Desert Championship is being held in Ensenada, Baja California, Mexico, 85 miles south of the U.S. Border at San Diego. Through Monday evening, the SCORE Baja 500 has teams entered from 22 U.S. States and 10 countries ready for the green flag to drop as they compete in Pro and Sportsman classes for cars, trucks, UTVs, motorcycles and quads in the 48th anniversary of the popular. The starting grid for the 477.52-mile race includes 32 entries so far in SCORE Trophy Truck, the marquee racing division for high-tech, 850-horsepower unlimited production trucks, 28 in Class 10, 19 in the unlimited Class 1, 16 in Trophy Truck Spec and 14 each in SCORE Lites, Pro UTV FI and Pro UTV. While pre-race festivities start Thursday, the green flag will drop in the elapsed time race on Saturday. Motorcycles and quads will start at 5:30 a.m. and cars, trucks and UTVs will begin their starting sequences at approximately 10 a.m. The start/finish line area will again be adjacent to the Riviera del Pacifico Cultural Center in the heart of Ensenada.